This newly-bottled Gahan offering pours a fairly dark, clear brown. It has about a finger of fairly dense tan head. There is solid lacing at the start, switching to rings / splotches that look somewhat grainy - a bit like powdered milk. In the nose are some oats, and almost a smell of corn. Slightly sweet, faint chocolate. I wondered if I picked out a bit of DMS? Maybe not. There is something slightly butterscotchy & refried-black-beany about it though - sweet and earthy - which briefly reminded me of "off"erings from some other regional brewers in the last year. There are light, roasted flavours of coffee, oats, and maybe some dark, grainy chocolate. There is something slightly and lightly Nutella-like about it (probably the chocolate mixing with the roasted / nutty notes combo, I guess). Carbonation is light, but there. The mouthfeel is on the light side of medium. The finish is rather dry, and slightly bitter. Overall... you know what? It's alright. The finish is rather flavourful, and there is nothing really off about it... not too shabby. My one main criticism has nothing to do with the beer: Why the boring label? Why not use what they have as a tap label at the pub - it's a much better logo. Great review! The Brown has never been a favourite... I'd be much happier if they released their stout instead for winter. D'oh! As only an occasional visitor to the Island I'm a bit confused about Gahan beers. Are all the beers made and packaged at the Sydney Street site, or do they have a 2nd brewery somewhere? Too bad they didn't sell at ANBL. Hi, Ken. Gahan has two brewing sites: one under the pub on Sydney Street (moved here from the first brew site years ago - basically between their Dooly's [now ISE's] and Lonestar on University Ave), and one at 2 Walker Drive. For the most part, the pub brewed for the pub, and the brewery brewed for the commercial bottle sales. They are currently trying to get more consistency between the two so that the bottled product better matches the pub, and so that the beers will vary less between batches. Agreed with the above post concerning their stout... it is, in my opinion, easily the best of their beers. Too bad stouts are never the most crowd-friendly, at least not with the non-beer geek crowd. I've been drinking Iron Horse since it was first released in PEI as a microbrew offering. 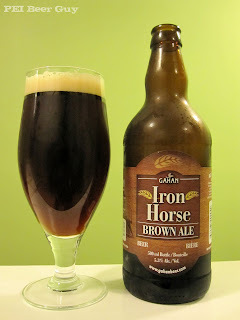 Their Red is pretty good, the stout is nice too but I've always been partial to the Iron Horse. When I walked into the liquor store and saw it in bottle form I think I cried a small tear of joy. At home, took my first drink and I was pleasantly surprised at the consistency between bottle and pub brew. The only thing I noticed is that by the end of the bottle the taste seems to change to a little less appealing where I don't find this in pub form. Not sure what it is. All in all - here is one happy customer.